Yesterday, head of Ogero Imad Kreidieh announced on his Twitter page (link) the upcoming DSL plans which are still awaiting our government to ratify in order for them to be operational. We’ve actually been waiting for over 40 days as Mr. Kreidieh had previously imagined the plans to be functional starting April 1st. However, as it is with Lebanese governance, anything that could serve to improve our quality of life in such a way got delayed, as our politicians bicker over that new electoral law which they won’t be able to come up with. At this point, figuring out the existence of parallel worlds is easier. In a series of tweets, Imad Kreidieh said that most of the new plans won’t feature any speed limits which means you get the speed that your line can handle. This is a double-edged sword: while it’s good to know that some of us might be getting more than the 2Mbps we currently get, any future problems we might face could then be blamed on the quality of our copper lines. However, as I’ve asked Mr. Kreidieh on Twitter back when the “Unleash The Speed” campaign was underway in different areas of Beirut, the speed that your line got on that day is the speed you’d get under normal conditions once the new plans are implemented. I personally got 12Mbps back then and would be happy to get that much on a daily basis. Extra consumption will also be made cheaper: the first 50GB are priced at 1,500LL each, with each GB after those priced at 1,000LL. I think the new plans are fair. They’re much better than what we previously had, but a far cry from what we truly need. For instance, I have no idea if the new quotas will be enough with the new speeds we’d be getting. Can you imagine how many GBs you’d race through when YouTube decides to automatically load in HD? I hope that these plans are, therefore, a stepping stone and that we won’t need to wait another 3 years before they get updated again. Let me start by saying this: Imad Kreidieh is the example of a Lebanese official that we need more of in every form of governance. Not only has he put his predecessor to shame in the 8 weeks he’s been heading Ogero, but he has also done so to every single Lebanese politician with how he has been clear, thorough and keen on making sure transparency is key in everything he does. New plans with faster speeds and bigger quotas as well as reduced pricing should be available in the next 2-3 weeks pending a decree from the Ministry of Telecommunications. Internet will not be as fast as it can be until infrastructure is changed, notably that of exchange sites (or centrals). The project regarding this will have its tender on April 19th with implementation following soon after. Drastic improvements should start being available in the Fall of 2017. Unlimited internet might come back to Ogero users. New ministry decree will slash the one month wait period between switching ISPs (Switching from Ogero to someone else or vice versa). As for things that we will get to experience sooner rather than a later, Mr. Kreidieh announced opening up all of the possible internet speed in Beirut on three separate days, which will be April 9th (this Sunday), April 11th (next Tuesday) and April 13th (next Thursday). Each day will see a different part of the Greater Beirut area receive as fast internet as possible, depending on how much your line can handle. On April 9th: Badaro – Mazra3a – Elissar – Mrayjeh – Jdeideh -Hazmieh – Ras Beirut – Riyad el Solh. On April 11th: Furn el Chebbek, Bir Hassan, Hadath, Amrousiye, Adlieh, Hamra, Choueifat, Nahr. On April 13th: Dawra, Sin El Fil, Chiyah, Achrafieh, Mina el Hosn, Ras el Nab3, Dekwaneh. Of course, since Lebanon isn’t only Beirut as one of the people asking Kreidieh said, other regions in the country will have on Sunday starting April 15th to benefit from the same event whereby internet speed will be uncapped with each user getting as fast a service as possible depending on how far they are from the exchange. Faster speeds will be available from 8AM till 8PM and feedback is requested either on Twitter at @ikreidieh, or by emailing ogero on thepeople@ogero.gov.lb or at Ogero’s Facebook account, which you can access here. Posted on June 1, 2013 by eliefares Tagged 4GAlfaInternetLebanonLTETelecom	Comments4 Comments on 4G LTE in Lebanon – The Review: A Premature Venture? 4G LTE in Lebanon – The Review: A Premature Venture? I’ve been using 4G around Beirut for the past two weeks. Alfa were kind enough to give me a dongle and a line with a 10GB plan for that purpose. The result, 2 weeks in, is that I am less impressed than when they first showed me the service back at some ministry events. I personally didn’t use the dongle because it doesn’t allow me to really test coverage. Don’t expect me to hop around with it connected to my Macbook pro for testing purposes. So I used the line I got on my iPad mini, which I carried everywhere I went around Beirut, giving me a more or less similar impression of what to expect on mobile phones. The maps being circulated around for Alfa’s coverage (MTC has similar coverage as well) show a very well covered Beirut. The reality, however, is much less optimal than that. For example, Alfa’s map shows that both Beirut Souks and ABC have LTE towers nearby to enable indoor coverage. I can count on one hand how many times I had indoor coverage in both of those places. Outdoor coverage is also spotty sometimes and you will find your device switching between 3G and LTE often. Coverage in Achrafieh stops around St. George Hospital. Anything East to that doesn’t have LTE. Coverage in Hamra, when I tested it, was borderline horrible. The LTE I got simply didn’t work and when it did was far less optimal than the 3G I was using on my iPhone 5. I had possibly Lebanon’s fastest internet in my pocket for a few weeks, though I guess that’s not saying much. In fact, while the bandwidth I was getting is possibly impressive in itself, it somehow becomes less stellar when you realize that this is less optimal for what 4G LTE should be giving you. My friends in the United States are used to an average of 20 Mbps with speeds reaching 60Mbps sometimes, something I haven’t seen in any of the many, many speedtests I’ve done, fully knowing that the 20Mbps figure was what an alfa spokesperson said to expect on average in Lebanon. Now I wonder, if we are still in the phase when there aren’t many users sharing the bandwidth and we’re not getting the average speed, what can we expect when 4G is rolled on phones? I enjoyed the fast speed that I got whenever I did. For instance, I downloaded The Perks of Being a Wallflower off iTunes, its size being about 1.4GB, in slightly less than 2 hours by creating a hotspot out of my connection. Songs that I purchased from the iTunes store would download in less than a minute. I didn’t need to worry about the time it would take an app to download or update – even if my iPad fell back on 3G more often than not in many of the tasks I mentioned earlier. I also really enjoyed the leisure that the 10GB quota gives. It is, however, priced at $99 per month which means it’s definitely not within my range. The quotas, on the other hand, are not 4G-centric. There has been constant talk about how we have the best 4G prices. This isn’t true. You, as a user, are subscribing to a mobile data bundle, not a 4G bundle. If your phone supports 4G and you find yourself in a 4G area (only Beirut at this time), you automatically switch from 3G to 4G, which means you use the same bundle that you had all the time for 3G to use 4G when available. So if you find 3G quotas unacceptable, the same logic still applies. Are the bundles enough? As it currently stands, I would still say they are overpriced. However, I believe the quota itself will suffice, even with 4G, because the speeds are not that much better than optimal 3G (I have seen 3G speedtests that are better than some 4G ones I did) and coverage isn’t good enough for you to burn through your MBs without noticing. Moreover, LTE will absolutely demolish your battery life. I was literally able to see the battery percentage of my iPad mini dropping in front of my eyes the more I used LTE, which could be because coverage isn’t as good as advertised. So be prepared to have your chargers around when the service is rolled to mobile phones. Trust me. You will develop battery-phobia. I think 4G LTE currently in Lebanon is a premature venture that we’ve undertaken. Of course, things are bound to improve from now on and I have to say that my experience with the pilot phase of 4G has been better than the pilot phase of 3G which was all over the place. But do we really need 4G now when there are many facets of our internet sector that are in a much dire need of improvement? Of course, 4G is great and all. And to further develop economically, our country desperately needs such measures. But couldn’t it have wait a year or so more pending bettering the service before rolling to the public and providing further improvement for our 3G services? If it were up to me, I would have waited on 4G and developed Lebanon’s 3G even more because our 3G coverage, based on my experience abroad, is not the best that it could be yet in spite of all the tangible improvement we’ve seen recently. Posted on January 20, 2013 by eliefares Tagged blogemailFacebookInternetIsraelLawLebanonTwitter	Comments36 Comments on What’s The Legal Limit of Cyber Lebanese-Israeli Contact? What’s The Legal Limit of Cyber Lebanese-Israeli Contact? In the age of the internet, we, as a Lebanese, are bound to stumble on Israelis who are just like us – browsing around – and many of them actually reading the blogs we write, the pages we share, possibly even following us on twitter and others befriending us on Facebook. For example, in the past few months, I’ve gotten over 3000 users from Israel to read this blog. And I cannot not allow it. And frankly, I don’t mind them reading. I don’t have Israeli Facebook friends – I felt like this had to be put out there to prevent any sensitive folk from starting to hurl treason charges from the get-go. My question is simple: when does our internet interaction with Israelis become illegal? Is replying to a comment by an Israeli on this blog considered illegal? What if I didn’t know he was Israeli? Am I supposed to track every user’s IP to know their country of origin? 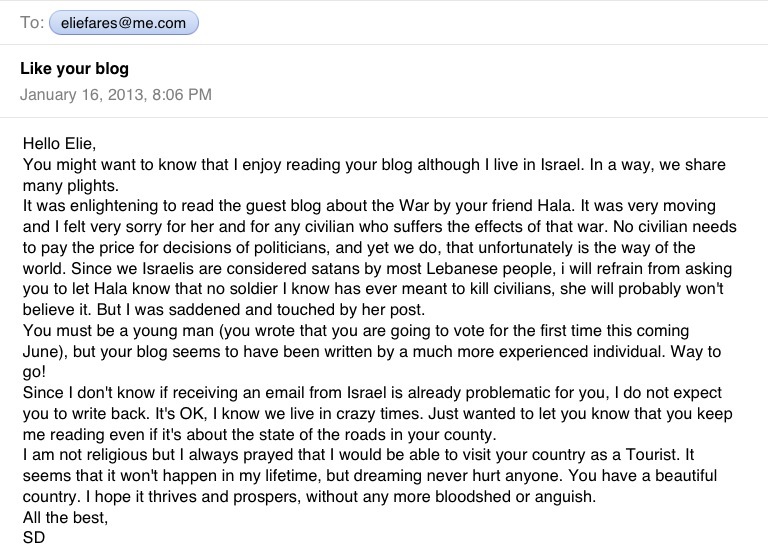 Can I not reply to emails by readers who happen to be Israeli and who are telling me that they enjoy what they have to say? I’m not advocating normalization. 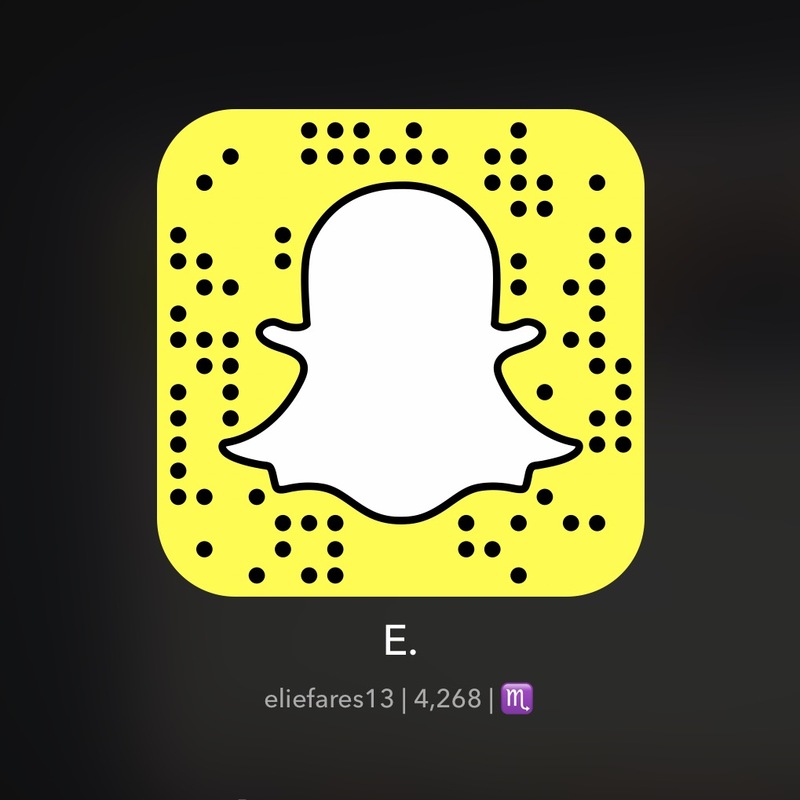 In the case of war, I – Elie Fares – would be the first to support whoever wants to defend my country because they are, at the end of the day, my people. But don’t you think that worrying about an email or blog reply to another person who might as well be just like us is taking it too far? This reminds me of a day when I was searching for an article to read about Lebanon’s oil reserves. One of those articles was on Haaretz, which required you to register in order to be able to read the article. And I couldn’t register because I didn’t know if that would be considered illegal as well. Is that normal? Is that how things are supposed to be? Thank you for your email. I’m sorry I couldn’t reply earlier and I believe this isn’t quite the reply you were expecting. But it’ll have to do for now. I was told not to reply via email. Others told me of a workaround that couldn’t be tracked but that would have been way too fishy. So I figured I’d do it here, out in the open, because I really have nothing to hide. This is, after all, a simple reply to an email. I am not as young as you think I am – voting age in Lebanon is 21 and I’m already beyond that point. And thank you for always reading – even if it’s about the road state in my country. I’m afraid your wish will never happen in our lifetimes. It’s the way things are. But I know many Lebanese would love to visit our enemy to the South. So what is our legal limit as Lebanese when it comes to internet contact which is becoming frequent lately with Israelis? Where is that line that we don’t really want to cross? Beirut Spring has just reported that a Now Lebanon article criticizing Saad Hariri and praising Najib Mikati has been pulled offline by the website. You can check out a screenshot of the article here. If we are to believe a report in al-Joumhouria newspaper on Monday, French President François Hollande and Saudi Arabian King Abdullah, in a meeting also attended by former Lebanese PM and Future Movement leader Saad Hariri, will not back current Lebanese Prime Minister Najib Miqati if a new government is formed. Do the Lebanese not have a say in any of this? We should worry at the carefree way in which Lebanon’s future is always being decided by outside actors, no matter who they are. The region is already polarized between the Sunni and Shiite communities in a dangerous standoff between Saudi Arabia and Iran. Such horse-trading will only serve to entrench further the sense that foreign powers control Lebanon’s destiny and that each side of the political divide is justified in having its regional backer. Another worrying aspect was the presence of Hariri, a man who must surely concede that his role in Lebanese political life must now be confined to the margins of Sunni politics. He is living in LaLa Land if he still feels that the Lebanese public would welcome him back with open arms and see him as their salvation. In fact, it would be scandalous if he stood for parliament in the next general elections, let alone offer himself as a candidate for the premiership. (Ditto Nayla Tueni and the rest of the absentee MPs who, by their negligence, have done their best to snuff out the flame that was March 14 and insult the intelligence of the voters who sent them to Najmeh Square). For it is not enough to simply oppose March 8’s fiendish agenda and make all the right noises about democracy, independence, sovereignty and the sanctity of the state. March 14 members must also take seriously their roles as public servants. The recent deterioration of infrastructure and the apparent collapse of law and order during August have woken up the public to the fact that if they want a functioning, safe, peaceful and prosperous country, and if they want laws enacted, it will not happen if the people they elect to achieve these ends are nowhere to be seen. Which brings us back to the issue of Miqati and his suitability for the premiership. When he accepted to lead the Hezbollah-dominated government in the spring of 2011, many saw him as an opportunist who would trade what was left of Lebanon’s integrity for a place in the history books. In reality and with hindsight, he has not done a terrible job. He has advanced the Special Tribunal for Lebanon (despite the Syrian dream of killing the process altogether) and spoken out against Syrian violations of Lebanese territorial integrity.Given the fact that he has had to work with a cabinet of which Hezbollah and its obstructionist allies in the FPM are a part, he has made a decent fist of holding things together. Hollande and the rest of the international community are right to condemn the current government, which has set new standards in uselessness, but we should avoid throwing the baby out with the bathwater. With the exception of former Prime Minister Fouad Siniora, Miqati is arguably the best candidate we have to lead this country in troubled times.In the meantime, the Lebanese must fight to wrestle their destiny from the hands of those who see Lebanon as a strategic asset instead of a sovereign nation, and all our MPs, without exception, should show up for work. Saad Hariri, it seems, cannot take criticism. Especially when it’s coupled with praise to his political adversary, which is beyond disgraceful. It seems that Saad Hariri is so worried about his political tenure, all the way from his Parisian lala land (be careful of the cold dear MP, I heard it’s quite chilly this time of year) that he pulled his strings all the way to Lebanon in order to pull the article off a website in which he has influence. The fact that Saad Hariri cannot take criticism is beyond worrying. It’s also very childish. It’s akin to one of those impertinent children who run to their mothers whenever those “bad kids” on the playground don’t let them play. And this type of behavior is certainly not acceptable from the proclaimed political leader of one of Lebanon’s main parties. The sad thing though is that this doesn’t only apply to Saad Hariri. Each and every Lebanese politician is off limits by some platform or the other – and what remains, at the end of the day, is an electorate who’s limited by the narrow political opinion it gets from websites that are censored by the politicians it thinks are the best of the best. And they all run to their mothers crying. They seem to be missing one key element though: good luck silencing the internet. Disclaimer: NOW Lebanon has intentionally removed this article from the site. It was not removed because of censorship, but rather because of the lack of proper arguments. We would like to repeat, again, that NOW is not owned, in whole or in part, by Prime Minister Saad Hariri, nor any other political party or figure. Yeah, right. Such “justifications” are an insult to Now Lebanon’s reader’s intelligence. Plus961 has written about Lebanon starting initial testing for LTE in about two weeks. The article that Rami quoted, which was published in Annahar (click here), sets a timeframe for initial pilot testing starting November 16th while commercial rollout will start in select areas across the country on April 23rd. The area that will first be covered is Beirut city, from Geitawi onwards. LTE theoretical speeds according to Alfa testing have reached 100Mbps. Actual speeds will be quite less, however, around 40-50 Mbps in best case scenarios. The average speeds that my American friends on Verizon get are approximately 30Mbps. A source in Alfa has told me that the frequency bands Lebanon will be rolling out will be band 3 (1800 MHz), initially, with other frequencies added later on, which makes the Lebanese LTE network compatible with most international 4G handsets, apart from the ones that are made proper for AT&T, Canada’s Bell, Rogers and Telus and a few Mexican carriers who have opted to use the frequencies that are employed by the aforementioned carriers: band 4 (AWS) and 17 (700b MHz). I assume it’ll be the same for MTC. This means that prospective iPhone 5 buyers need to buy their phones from European countries or Australia. The American Verizon iPhone works as well. The plans, however, haven’t been set yet although I don’t expect them to be up to par with the potential demand. LTE is very fast internet and any plan that doesn’t go into several GBs in quota is doomed to be quite useless. Theoretically, you can burn through the 500MB plan (the most popular one among 3G subscriptions) in less than a minute. On the other hand, and even though LTE is needed to move the country forward in the ever growing digital age, should we be moving towards it when there are a lot of areas in the country without proper basic coverage, let alone 3G? For instance, my hometown in the Batroun caza barely gets any reception. 3G is unheard of over there. Moreover, moving towards LTE will also get our ADSL speeds to considerably lag behind with the optimal state households get being 1Mbps. But either way, since many believe I criticize too much, I’ll leave at that and hope LTE rolling out in Lebanon turns out better than the way 3G was unveiled.